Dimtsi Woyane interview with Ambassador Seyoum . Discussion on Ethiopian Origin Id Card. Interview with Minister Abay Tsehaye. (Aigaforum) May 19, 2012- In an online interview with gezategaru Minister Abay answered many questions in regard to the Growth and Transformation Plan(GTP), TPLF/EPRDF leadership transition and an assessment of current national security issues in a very thoughtful and candid manner. Ato Abay veteran and founder of TPLF has been a key player in Ethiopian politics ever since he was a young student at AAU. Today Ato Abay is leaving another key legacy to the coming generation by leading the development of key future economic sector! Ethiopia is indebted to Abay Tsehaye and we hope the coming generation and the current torch bearers will keep and build on the legacy Abay and others would be leaving! 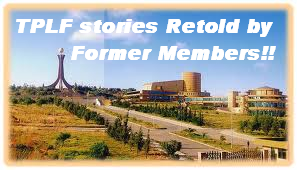 Contemporary Tigrean History in the eyes of veteran and former TPLF members. The significance of the TPLF cultural troupe to the success of the Tigrean struggle against Derge regime can not be told in a single interview or single volume. The troupe was all about what self reliance was all about. The artist, musicians and singers all home grown and using local instruments galvanized the people to support the struggle. Many have died fighting heroically and many have retired to private life after victory. Few from those with us today, Abebe, Shumuye, Fikre(Wedi Soboka) and Rishan were guest on an online discussion to share their experience and more on Jan 29, 2012. TPLF did not get where it is today as a successful political organization without tribulation and ups and downs. There were many events when its future looked bleak because of natural disaster and internal dissent among its leaders. One event that is talked about is the dissent of Gidey Zeratsion and Dr Aregawi Berhe, both founding members. Gidey Zeratison met an online audience to discuss why he left TPLF and his view of TPLF before the formation of MLLT and after. The other unsung heroes from the Tigrean struggle to defeat the derge regime of Ethiopia are the members of the Union of Tigreans in North America and Europe. Friends and supporters of TPLF as well as members of the Tigrean community in Diaspora met Ambassador Fesseha Asghedom, Ato Wahde Belay, Ato Oumar Mohamednur, and Ato Mulu Assefa, all veteran UTNA members, in an online discussion forum to learn more about the then UTNA! BetreSeltan from VOA Tigrigna interview with Aboy Sibhat Nega and Dr Aregawi Berhe. Betreseltan asked Ato Alem about the reported drought and malnutrition in Ethiopia. Ato Alem denied there is any drought specific related malnutrition but that the deep rooted poverty is still a problem in many ways in Tigrai! You want to know the secrets of TPLF success? You want to know a little about what courage is, what valor is and what "tsinat" means! If you do, listen to the following round table discussion with former members of TPLF. It will give you a window view in to the vast, rich yet magnificent history of the TPLF and the Tigrean people who successfully defeated one of the largest army in Africa! The discussion was recorded on the occasion of the 36th Lekatit 11 anniversary at Dedebit-meqalih online forum on Feb 20, 2011. Col Yitbarek comments on current events and on former TPLF members in Diaspora who are badmouthing TPLF history. Colonel Yitbarek disagreed and criticized Asgede for undermining TPLF�s history and for defaming the many heroic fighters and leaders of the TPLF. The colonel exposed many of Asgede�s false accounts, as an eye witness and as commander of TPLF regiment, who went to Sahel Eritrea to fight the Derge! Interview with Ato Besrat Amare on BBC falsified Story. Ato Besrat was a former member of TPLF assigned to a much higher position than some of BBC sources for the now falsified story on the misuse of Aid grains some 25 years ago by TPLF. BBC could have asked people like Besrat all over the world to find out more on its regrettable story on Aid, but it did not. Shame Martin Plaut to have only one disgruntled source. Ato Besrat shared based on his experience how Aid was distributed and who in TPLF could be in a position to know of any �misuse�..